The Esplanade is a famous cultural landmark because it houses concert halls, studios, theatre, auditorium, library, mall and, more importantly, a gallery. The gallery space is wide with fine selections of artworks. The admission is free. For inquiries, you can call them at (+65) 6828-8377. Opera Gallery is located in ION Orchard. The gallery offers high-end art. They have collections of artworks from Chagall, Miro, Dali, Guguin, Buffet, Braque and Picasso. 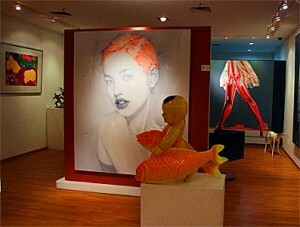 Aside from international artists, the gallery also exhibits works of local artists. When you buy artworks here, you will be assured that you are buying from experts. For any concerns, you can call (+65) 6735-2618. Utterly Art is located on Mosque Street. The gallery presents eclectic art pieces that will surely excite anyone with an artistic bent. However, you should call first (at (+65) 9487-2006) to make an appointment before visiting. There are other art galleries that you can consider. There’s Tyler Print Institute, Living Portraits Gallery, Ngee Ann Cultural Centre, Dynasties Antique and Art Gallery, Aseana Gallery, Asia Ancient Gallery, Art Facet, Connoisseur Art Gallery and many more. Appreciation of the arts is not a bad thing. If you need to buy something, do it! At the end of the day, the important thing is you are happy with whatever you purchased. This entry was posted on Wednesday, July 17th, 2013 at 3:06 am by Editor	and is filed under Smart Choices. You can follow any responses to this entry through the RSS 2.0 feed. You can skip to the end and leave a response. Pinging is currently not allowed.